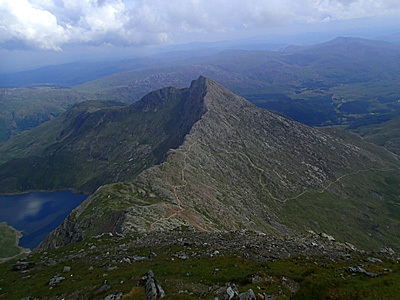 I have graded this trek a hard Snowdon trek for two reasons. 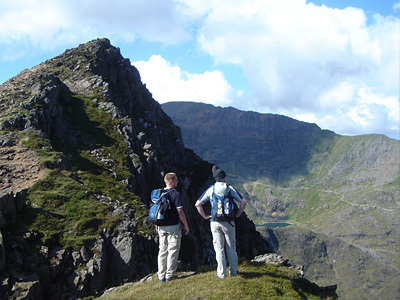 The first reason being that the starting point is only 65 metres above sea level compared to the starting location of a couple of the moderate treks (pyg track and the miners path) at the Pen-y-pass car park which is at a height of 360 metres. The second reason is just before we reach the last part taking us to the summit we encounter a very steep gradient combined with loose scree underfoot and steep drops to the left so a good head for heights and sure footing is definitely needed on this route. This is the ideal trek if you are considering attempting Everest base camp or Kilimanjaro as this will give you a good idea of the level of fitness required to complete these treks. This trek starts by going through a lovely wooded area following a defined footpath, after going around a sharp bend the path rises steadily with the remains of the old tramway high above on the left and a series of waterfalls with gorgeous blue drop pools parallel to the path on the right.The track then opens out dramatically to a large almost flat area passing the iconic Gladstone rock which was named after William Gladstone the then prime minister who at the age of 83 opened the path in 1892. We carry on walking until we come to the remains of the South Snowdon slate quarry The hard work now begins as we steadily gain height until we reach another small flat area with massive drops ahead down into Glaslyn lake far below and the notorious Crib Goch ridge in the distance we then turn left over rough and rocky terrain until we come to a steep slope in front with the south face of Snowdon towering over 200 metres (700 feet) above, this is without doubt the hardest part of the trek. We carefully negotiate this very steep section with loose underfoot conditions and big drops to the left until we come to a small upright marker stone which signifies we have now reacted the intersection with the south ridge joining from the left which leaves us a short and steady trek to the summit. 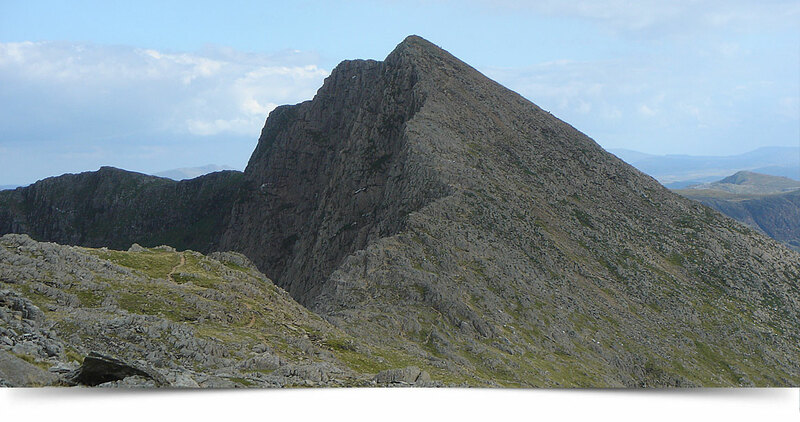 This trek is suitable for clients with limited previous scrambling experience and is an ideal route to test your head for heights if you have ambitions to complete the Crib Goch knife edge ridge There are 330metre (1,000 foot) shear drops to the right and definitely requires a hands on approach but if it gets too much we can step away from the edge and take a less dramatic line. The final section picks up the toughest part of the Watkins path with a very steep slope combined with loose underfoot conditions that require us to be surefooted; a good level of fitness is also needed to complete this fantastic trek. We have now gained the ridge below Lliwedd Bach. The fun now begins as we scramble up to the twin peaks of Y Lliwedd with a shear 1,000 foot drop into Llyn Llydaw far below and fantastic views across to Crib Goch we now scramble down steeply over more rugged terrain aware that we have to regain this height later. The Watkins path now joins from the left at Bwlch Ciliau with the toughest part of the trek now directly in front which will eventually take us over 700 feet upwards to the summit of Snowdon This section needs to be negotiated carefully as the underfoot conditions are very loose with big drops to the left. We then meet the south ridge taking us to the summit on this very rewarding trek.